I had visited Amritsar last year. One of the lasting memories of my trip was that of my Harmindar Sahib (Golden Temple) visit. I finally got to see the langar (holy kitchen) there that I had heard so much of. The massive scale of the kitchen amazed me. By the number of people fed every day. The joy, with which volunteers cooked, served and cleaned up the dishes afterwards. The sheer consistency of the food and the warmth with which it was offered was humbling. This was no ‘hell’s kitchen.’ The sense of calm and peace here was something to be treasured. For a food lover this was heaven on earth. This got me thinking. Are there more places like this? Are there more untold stories of folks selflessly working to feed thousands of people? Are there more such examples of efficiency that we can celebrate in the world of Indian food? Then I got to know about the new program called ‘Mega Kitchens’ that National Geographic Channel (NGC) is launching. It covers industrial scale kitchens across the country. Some of these are professional kitchens like those run by the Indian Railways and by flight kitchens. Kitchens, which demonstrate scale and proficiency that can, match the best in the world and make us proud of our country. The others are kitchens that run solely on love. Kitchens of religious places, charitable organizations, places that feed multitudes with a smiling face. Places that send off tired and hungry devotees, underprivileged children home well fed. Don’t expect these to be kitchens that survive just on good luck or chance though. Most of these use modern techniques and processes such as assembly lines and even solar power to feed those who come here. You can see some of these fascinating, humbling and awe inspiring stories on the Mega Kitchens series. 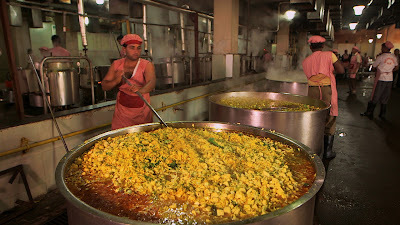 Saw the first episode on shirdi last night, simply marvelous how they work so systematically towards catering to 40k pilgrims on an average each day. The solar power idea and execution took the cake.